This book is meant as a general legal and social guide for foreign nationals who wish to establish themselves in Swedish society. The Swedish legal system however, is a complicated system and in the case of larger transactions and more complex scenarios we strongly encourage you to seek professional legal counsel to analyze the specifics of your case. Statistical information is provided with an effective year when the survey used to compile the statistics was taken and the results published. The format of the effective year is, for example, marked as "eff. 2015" indicating that the information was last updated and published in 2015 by the third-party (often government) source. To familiarize our readers with the Swedish language and its basic legal terms we have chosen to use a large number of Swedish terms throughout the book, with the closest English translation given in brackets next to it. All Swedish terms used in this book can also be found in our Swedish-English glossary in Appendix I. This format contains the book’s website (liveandworkinsweden.com which is a shortened version of www.liveandworkinsweden.com) followed by the assigned forwarding address (which in this case is /ch1f1). An advantage of this approach is that it is easier for the reader to manually type in a URL since it is being supported as a form of "shorthand" URL. While the editorial team will strive to keep the URL forwarding up-to-date, we greatly appreciate any feedback concerning any broken links that you might encounter – please use the Contact Us portion of this website to let us know if a specific link does not work so we can investigate it. In cases where the original source changes content, removes a page or discontinues any mention of the referenced content, we reserve the right to reference another source that has equivalent or similar information to the original source (e.g. this is common when one government authority takes over an area of responsibility that was previously handled by another government authority). In some cases, the editorial team may add a link on this website to inform the reader of any significant changes. Please note that the URL forwarding service terms and conditions as well as availability are subject to change. Aurenav Sweden AB and the Editorial Team reserve the right to make changes to the URL forwarding service. Any such changes will be announced on both this web page and in the Website Terms and Conditions at least thirty (30) days prior to being implemented. 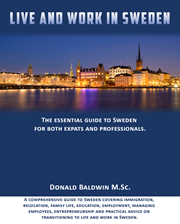 Availability may also be dependent on the currently supported version(s) of the book Live and Work in Sweden.